What is the applicable warranty on Duchesne products? Generally speaking, Duchesne products are guaranteed against all faults in manufacturing. As well, certain products, such as vinyl siding, come with a specific warranty. For more information, check sections for desired products on the site. Where can I obtain Duchesne products? Products manufactured and distributed by Duchesne are available from a large network of dealers of building materials. To find the closest dealer, please check out the section "Dealer locator". Can phosphate coated nails be used for outdoor jobs such as building a fence or patio? Many users believe, incorrectly, that the rough finish of phosphate coated nails protects them from rust and corrosion. In fact, this coating is added to these nails to ease penetration in the wood and increase holding power. It offers no protection against rust and corrosion. Stainless steel and hot galvanized nails are the best alternatives for most outdoor work. How many nails are there in a pound ? All the new Duchesne formats now indicate the nail count per box. This way, it is far easier for you to determine your requirements for a specific project. Is there a rule for determining the length of nail required for a specific application? The general rule is that nail length is based on the following ratio: 1/3 of the length goes into the object to be nailed and 2/3 in the piece to which the nailed object is attached. The exception to this is the concrete nail, 3/4" of which must be in the concrete at all time. What finish will give the best results for my wood-treated patio? Stainless steel nails are the best choice for this type of work because they ensure optimal protection against rust and corrosion and will prevent black streaks caused by the corrosion of inadequate fasteners. What is the difference between common nails and Ardox nails? Common nails have a smooth shank, whereas Ardox nails have a spiral shank to facilitate penetration power (thereby reducing the risk of splitting) and increasing holding power. How can you be sure your collated nails are perfectly compatible with the many brands of tools available on the market? Technical specifications have been determined for each type and length of nail produced, and these specifications are monitored regularly during the production process. In addition, we have obtained the main nail guns available on the market, and each batch of collated nails is tested in the plant with these tools. Our nails are also regularly tested by contractors on job sites. Where can I find nail and staple guns that are compatible with Duchesne collated nails? Duchesne collated nails boxes have labels that list some compatible tools. Furthermore, your dealer has a detailed list of brands and models of tools that are compatible with each type of collated nail manufactured by Duchesne. What is the main purpose of wire mesh? Wire mesh is mainly used for reinforcing concrete slabs to make them better able to withstand temperature extremes and heavy loads and to reduce the risk of cracking. What is the most important thing to keep in mind when installing wire mesh? To be effective, wire mesh must be correctly installed in the right spot. Ordinarily, the best spot is slightly above the halfway point of the slab's thickness. Wire mesh can be kept in place while the concrete is being poured by using specially designed support "chairs" or small blocks. How to make a distinction between polyethylene vapour barrier and the multipurpose film? In addition to the information on the packaging, the vapour barrier itself is printed with the CAN/CGSB51.34-M86 standard number, our accreditation number relative to this standard, and our Ultra + brand name. What are the main points to keep in mind when installing the polyethylene vapour barrier? Since the purpose of installing a vapour barrier is to create a sealed envelope inside the building, it is necessary to apply an acoustic seal on all overlaps as well as at the top and bottom of the wall. In addition, the joints must overlap by at least 6", and it is recommended that the film be stapled into the acoustic seal. What is the difference between multipurpose polyethylene film and the ULTRA + vapour barrier? Multipurpose polyethylene film is used for various jobs such as protecting surfaces and furniture while sanding and painting, building temporary shelters, doing garden work, etc. The ULTRA + polyethylene vapour barrier, manufactured in compliance with CAN/CGSB51.34-M86 standard, is used in walls to create a continuous, impermeable barrier to protect building insulation. Many manufacturing specifications are imposed to assure users a uniform, high-performing product. For example, a UV stabilizer and an antioxydant (preservative agent) are added to ULTRA + Vapour barrier to keep sun light and heat from degrading the film. This treatment also increases product resistance to cracks. These types of additives give the ULTRA + Vapour barrier a much longer life-span than the multipurpose polyethylene film. Generally speaking, what are the main characteristics of vinyl siding and soffit? Vinyl offers excellent quality for the price. It is dent and scratch-resistant, lightweight, easy to cut and easy to maintain. In addition, it keeps its beautiful appearance for a very long time. What are the main things to keep in mind when installing vinyl siding? It is essential to leave 1/4" between the edge of the siding panel and the mouldings to compensate for the contraction and expansion of vinyl. The nails must be driven in at a right angle, in the middle of the groove, and there must be 1/32" between the head of the nail and the siding. Can I install aluminum materials directly on ACQ pressure-treated lumber? No. New pressure-treated lumber with "Alkaline Copper Quaternary" (ACQ) replaces the old "arsenic-laced" (ACC) pressure-treated lumber which was abandoned voluntarily by the Canadian manufacturers following an agreement concluded with Health Canada. Some manufacturers offer a product showing the same qualities and the same longevity as the old treated lumber. The disadvantage of this new treated lumber relates to the corrosion of materials in direct contact. When two metals are in direct contact in a moist environment, the less noble one will corrode. It acts as the anode as the second, partly protected from corrosion, will be the cathode. This phenomenon is called galvanic corrosion or galvanic cell effect. 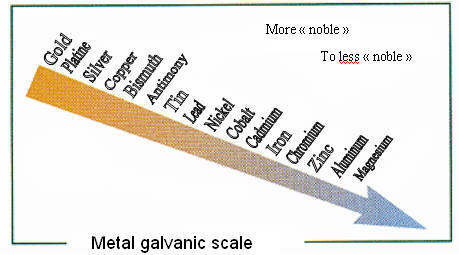 The further apart the metals on the galvanic scale, the higher the speed and importance of corrosion will be. Since copper and aluminium are very distant on the scale, galvanic corrosion is at high risk. Indeed, the presence of copper in great quantity accelerates the corrosion of aluminium. Therefore, you should not install aluminium materials on ACQ pressure-treated lumber to avoid damage due to premature corrosion. The degree of corrosion depends on many various factors. Some of the more relevant could be among others salt, presence of water, moisture content of wood, atmosphere, and the presence of other melts such as mechanically galvanized or steel screws. Generally speaking, what are the main characteristics of aluminum siding and soffit? Aluminum is lightweight and easy to cut and install. In addition, the high quality of its finish, along with its baked paint and a choice of darker colours make possible to create harmonious colour arrangements that enhance the appearance of buildings. What are the ventilation rates of your different models of aluminum soffit? Can steel roofing and siding be repainted? How much does steel roofing and siding weigh? Weight varies according to the thickness of the profile chosen, that is, from 55 to 100 pounds per 100 square feet of material before forming. If I decide to install steel roofing, how do I know what thickness is right for my building? Thickness depends on the snow loads in your region, the spacing of the strapping and the roof's slope. For a standard residential building, however, 30, 29 or 28 gauges are usually sufficient. Is it true that a metal roof is as silent as any other type of roofing material when it is raining? Yes, thanks to the insulation directly beneath the roof which absorbs the sound of the rain. What is the minimal slope required for installing steel on a roof? The National Building Code recommends a minimum slope of 3/12 for using steel on a roof. The R-value is the measure of a material’s resistance to heat flow caused by conduction and convection. The R-value calculation does not take into account the reflective capacity of Duchesne’s reflective insulation. Reflectivity helps reduce heat loss due to radiation, which accounts for 75% of a building’s heat loss. The greater the R-value, the more effective the level of insulation. What type of Duchesne reflective insulation should I use under a concrete slab, and what are its advantages compared to rigid insulation? Duchesne’s reflective insulation is flexible and strong. Unlike rigid insulation, it is not breakable. Thus, it can be walked on without being damaged while the concrete slab is being prepared and installed. In addition, it acts as a vapour barrier and protects against infiltrations of radon gas (inert, odourless and colourless gas that escapes from the ground and can infiltrate buildings). For this type of installation, we strongly recommend that you use Duchesne’s double bubble white reflective insulation (one side in aluminum, one side in white polyethylene and two layers of air bubbles). Of course, you can use single bubble white (one side in aluminum, one side in white polyethylene and one layer of air bubbles. However, your R-value will then be lower. It should be noted that it is extremely important for the white polyethylene side to be in contact with the concrete to avoid altering the insulation. What is the difference between Duchesne’s single bubble reflective insulation and its double bubble reflective insulation? Single bubble reflective insulation comprises a single layer of sealed air bubbles, whereas double bubble reflective insulation has 2 layers. Since the air acts as insulation, the double bubble product offers superior thermal performance. IS RVB REPLACING ULTRA +? No, depending on the needs of each construction project, either product may be used. IS THE REFLECTIVE VAPOUR BARRIER REPLACING REFLECTIVE INSULATION? No, reflective insulation has a thermal insulation value that RVB lacks. HOW DOES THE REFLECTIVE VAPOUR BARRIER COMPARE WITH KRAFT ALUMINIUM PAPER? Both products meet the CAN/CGSB 51.33 standard, but with Kraft paper, if there is condensation the paper will absorb the water. In addition, aluminum acts as a water vapour barrier. If damaged, it loses effectiveness. IS RVB ACCEPTED BY THE BUILDING CODE? IS THE CAN/CGSB 51.33-M89 STANDARD IDENTICAL TO THE CAN/CGSB 51.34-M89 STANDARD? No, they apply to different products: 51.34 for the polyethylene vapour barrier and 51.33 for vapour barriers using other materials. The two standards are still similar. They allow the product to be used in a building. CAN THE REFLECTIVE VAPOUR BARRIER BE USED UNDER FOUNDATIONS? Foundations are not designed to have an air gap under them. Because RVB’s added value is the reflective effect on an air gap, there would be no benefit to using RVB under foundations. CAN RVB BE USED FOR COVERING THERMAL BRIDGES? No, RVB has no insulating layer. So it cannot “protect” a building’s structure by preventing it from transmitting cold.